New Life in Spain: Santa María del Mar - La Catedral del Mar. There is a church in Barcelona. Well, there are quite a few, but for now I wanted to talk about one of them. Santa María del Mar. A huge, beautiful one, hidden right in the middle of the labyrinth of all the narrow streets of a part of the old town called “El Born”. Tucked in between all these narrow streets, so that suddenly it’s right in front of you without much warning. I personally love this area, I think it’s my favourite part of the old town. It’s charming, it’s beautiful, and oh so trendy with many art boutiques, café’s, restaurants and bars. But I am getting sidetracked here, I can talk about El Born some other time. I was going to talk about this Church, Santa María del Mar. 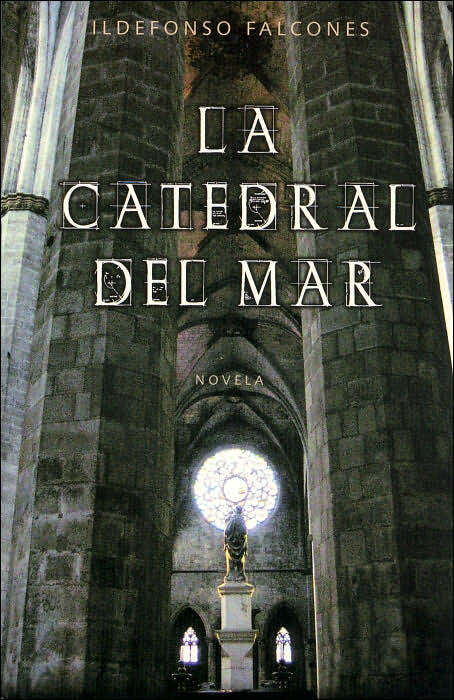 Cause in 2006, Ildefonso Falcones published a book called la Catedral del Mar, Cathedral of the Sea, a historic novel set in Barcelona in the 14'th century. The story is set around the building of Santa María del Mar and although at this point there’s no chance to see the sea from there from the masses of buildings, back in the day you could, as it’s less than one km away from the Mediterranean, thereof the name. I read it a while back and it kind of swallowed me a little, it was wonderful, almost magical, to read the story set in old old Barcelona, while being able to go out and walk around in those old streets and places described in the story. And entering the Cathedral, and realizing what a masterpiece it really is actually having some background information. In my time in Spain I have already seen several opulent cathedrals and coming from Norway with our wooden or stone churches with very little thought put into the “interior design”, these Spanish Cathedrals really are something else. Still, I am somehow more impressed by this one. It’s simpler, not so dramatically decorated, it doesn’t have gold everywhere, it’s just plain and simply beautiful, and knowing that it was built alt those years ago only with the human physical strength, and that the Basitaixos* carried the stones on their backs all the way from Montjüic… well it just gives the cathedral more life and soul for me. There is no entrance fee, which I think is great (and surprising), considering the increased popularity this church has received after the book became an international best seller. The first time I entered, I came in the middle of a wedding ceremony, can you imagine? As for the book, I loved it, the story is good, strong and sad. There's quite a lot of history in this book that got a little boring at times, too many kings and too many battles for my taste, but the main story is great. characters? Or have you read this one? *Bastaixos: those who built the cathedral, and carried the stones on their backs, voluntarily and without getting paid. Hei! Bra, bra. Er enig i at det er et must :) Ahh melkesjokolade, *savner*! Men hva mer? Kvikk lunsj? He he, her er det tydeligvis et sjokolade-savn på gang for det er alt jeg kommer på :P Dots! Ifa? Noe troll-greier? Vet ikke jeg, men så gøy det blir for henne uansett, helt sikkert! Takk ellers, og velkommen hit :) Hvor i Spania har du bodd? Santa Maria del Mar is my favorite too. I've seen some magnificently ornate churches in other Spanish or European cities, but few of them quite matches the grey, solid beauty of this church. It's supposed to be a hallmark of Catalan Gothic style of architecture. Luckily, I now live only two streets from it and get to step inside often. There's another good novel written by the same Carlos Ruiz Zafon, and its English title is "The shadow of the wind". It tells an intriguing story with Barcelona's bygone days as the backdrop. My another favorite spot, Plaza Sant Felip Neri is also portrayed in that novel. I also recommend a non-fiction "Barcelona" by a famous art critic Robert Hughes. It's a great read and my guide in discovering Barcelona, full of historical details, artistic insights and the author's snark humor of which I'm a big fan. Hi there anonymous! The Shadow of the Wind is on my shelf waiting to be read and after what I have heard I am sure I am going to like it! Don't think I've been to Plaza Sant Felip Neri, I'll put it on my list :) and I'll check out that third book, thanks for the tip!! Hi, it's anonymous again. The lack of decoration inside the church, as explained in Robert Hughes's book, was the result of destruction and vandalism the church suffered at the hands of anarchist types around and during the civil war. So I guess it used to have gilded interior like any other Spanish churches. I agree with him on the point that it maybe wasn't such a big loss after all, seeing the beauty of the now exposed bones. Thanks again for the insight. I am getting curious about this book, I think I will just have to buy it! And I also agree, Santa Maria del Mar is just beautiful as it is now. Wow, I'm not much of a church goer but I can appreciate absolutely gorgeous architecture! Thanks for the heads up on the book, I've put it on my (ever growing) list of books to read. Santa María del Mar looks gorgeous. I agree with you, sometimes you enjoy the simpler less decorated things. I fell in love with the Lotus Temple, just the simplicity and elegance of it all. I'm so glad to be back and catching up on what you've been doing! Great to have you back too! One time I hope to see the Lotus temple as well, it looks gorgeous! I'm a huge fan of historical novels, I've just finished Katherine, about Katherine Swynford, John of Gaunt's mistress/ wife. I love them, they're my favorite genre, but I haven't read this one yet. That cathedral is breathtaking and intimidating! Okey thank you for writting abou Barcelona and making our beautifull city more known aroud the planet, but I have to correct you in some mistakes that you've done. First there's only a cathedral in Barcelona, Santa Maria del Mar is simply a church. The cathedral of a city is the church of the bishop. In fact that's the amazing of this church, without having the suport of the bishop it is more beautifull that the cathedral it self. And the last one, the carriers of the stones only carried them from the sea to the church which was aprox. 100m (still alot). They carried the stones from Montjuic to the church by boat. It was a poeticall license of the author of the book. Sorry if I'have sound smarty, my english doesn't allow me to express myself in a propper maner. Don't mistrust me, I'm very thankful to people like you who write and tell the world about us, just wanted to give you some extra information. Thank you for everything! I really love this building. It's one of the few examples of authentic Catalan gothic style architecture in Barcelona.